This lovely salad has a really nice dressing to go along with it. The mixture of beans, walnuts, soy cheese and orange dressing was very tasty. Wash and trim the green beans. Slice in the size and shape that you prefer. Bring a pot of water to boil with a steamer basket. Steam the green beans al dente (about 5-10 minutes depending on the size and shape). When the green beans are cooked, plunge them into icy cold water to stop the cooking process. When they have cooled, drain them and place in a large serving bowl. Cut the red onion in fine pieces and add to the green beans. Squeeze the orange and place in a carafe or small mixing bowl. Add the olive oil and either the walnut or sesame oil. Add the salt, pepper and mustard. Season the vinaigrette to taste with any additional seasonings you prefer. Pour the dressing over the beans and onions and mix well. Allow to marinate for 15 minutes to 4 hours. 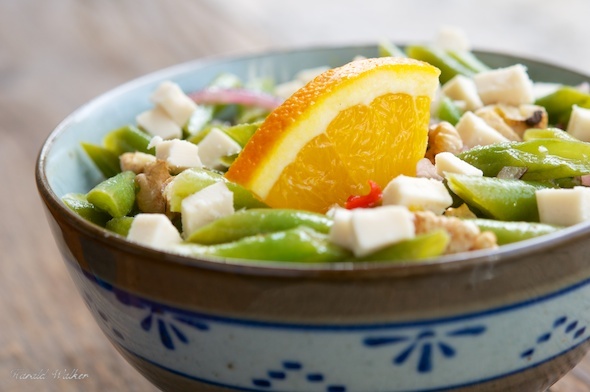 Shortly before serving, cut the soy cheese in small pieces or grate and add to the salad. Add the walnut pieces and mix well. Serve the salad in individual bowls or on a bed of lettuce. 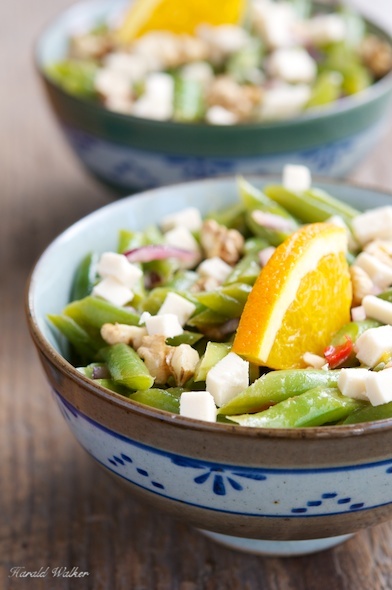 Posted by Chris Walker on March 5, 2013 in Green beans, Salads, Soy cheese, Walnut.